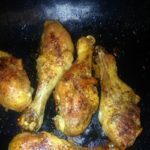 A quick recipe for some mouth watering chicken. I made this recipe and it's simple and very tasty! Arrange chicken legs in an aluminum oven tray lined with parchment paper. Dab 1 teaspoon of corn oil spread on each and sprinkle with seasoning. Rotate chicken and season on the other side. Bake in preheated oven for 30 minutes and then turn legs over. Bake another 35 to 40 minutes. Check and if needed cook another 30 minutes. A brush helps put the oil on the chicken. Grinding the seasoning in a coffee grinder an placing it in a shaker will insure even flavoring.